DESOTO—The notion that Irving MacArthur Head Coach Ronny Mullins has his hands full with the DeSoto Eagles Friday is the understatement of the season. Putting it gently, this is a year of transition for the Cardinals. Their ten year veteran Head Coach Brian Basil left for Flower Mound last year. Not to mention having almost no seniors with enough varsity experience to make a difference. On the offensive side of the ball, their only returning back would be in the form of Junior Wide Receiver Tyson Hardin. Last year Hardin made 44 catches, which automatically makes him the elder statesman. 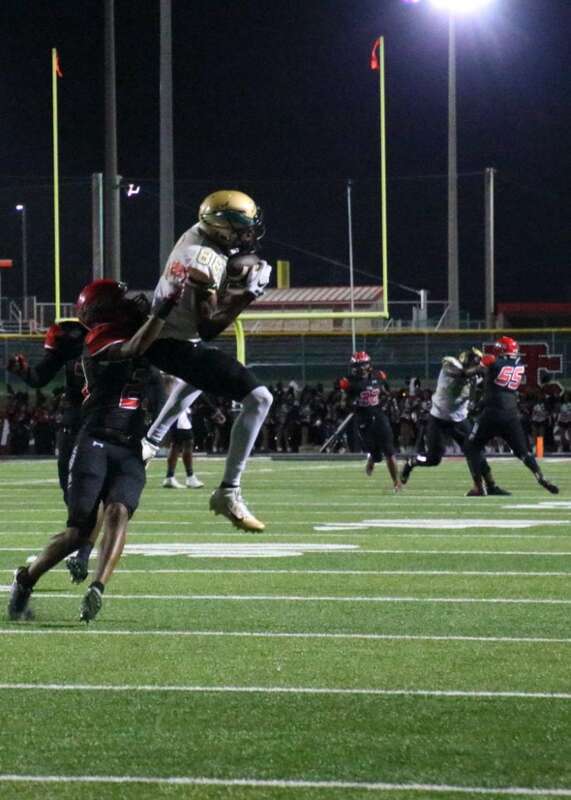 Facing the undefeated DeSoto Eagles, MacArthur might face another high scoring night of humiliation. So far this season, Mullins’ squad has lost by an average of 37 points. Fresh off a 33-18 win against Cedar Hill last week, DeSoto Head Coach Todd Peterman says despite Irving MacArthur’s record, his team practiced just as hard this week. My prediction: With DeSoto’s healthy offensive line starters, the pass protection should be excellent. I hope to see some spectacular throws from Army All-American Quarterback Shawn Robinson. Then, after the half, send the big boys to the bench and put Howard Pitts and William Brown back on the scrimmage. We don’t want to risk losing standout players in a gimmie matchup. Coach Peterman has a penchant for putting all the guys in his program on the field at one time or another. The score shouldn’t go past 20 in the Eagles favor. Emmet Perry hauls down a pass on the 35 yard line as the Eagles defeat the Cedar Hill’s Longhorns on Friday, September 23, 2016. There has been some conjecture among sports analysts that this might be the year that the Eagles will make it all the way to the big show in San Antonio. However, Coach Peterman says first things first … staying healthy, especially among his senior corps. 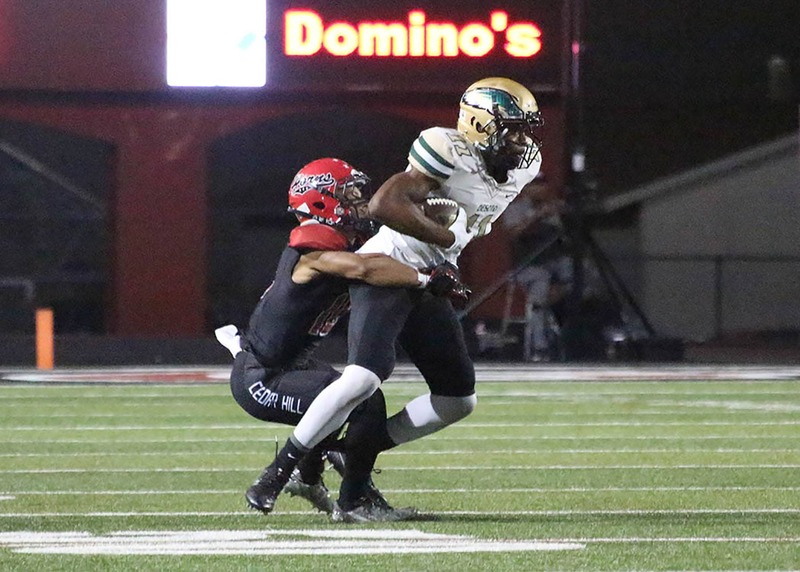 DeSoto still has a number of strong contenders to get past in district play. Grand Prairie (2-1) and Duncanville (3-0) football programs are making a strong resurgence. “We haven’t [begun to think about a possible state title]. Our first goal is to win a district championship. And you can’t do that unless you win on Friday night,” he said. Since I put the bug in his head, he is hoping for the perfect storm of events to bring the Eagles home during the playoffs. The Eagles seek to expand their winning streak to 4 at home against Irving MacArthur, Friday at 7:30pm.